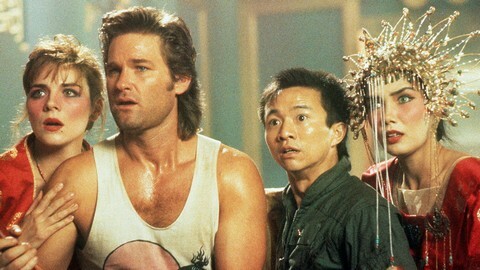 Kim Cattrall, Kurt Russell, Dennis Dun and Suzee Pai discover Big Trouble in Little China. The Skinny: Cult classic inspired by director John Carpenter's love of kung fu cinema particularly Zu: The Warriors from the Magic Mountain (1983), is, unfortunately, more Orientalism than homage. Adam Laidig: John Carpenter's Big Trouble in Little China treats the residents of San Francisco's Chinatown as if they are only tangentially related to the world around them – and that, by many accounts, is an accurate portrayal of the world's largest Chinese diaspora. It's forgivable, too, that Carpenter, whose career has been spent pasteurizing cheese (Halloween, Escape from New York) casts an esoteric action-fantasy with a blue collar hero in an insular locale the average American might find a tad bizarre at first blush. What feels so wrong, however, is how Carpenter treats all the fantastical elements as if they are commonplace to the Chinese characters (read: people) – and that ouldn't be a travesty in and of itself, given the film is a satirical fantasy, if so many of those characters didn't remind you of the Asian caricatures from as far back as the 20s and 30s. It's as if Big Trouble in Little China would have you believe, despite being an obvious work of fiction, that Chinese men on a whole are as daffy and loony as they appear on-screen here, and the plot is only a fantasy to the protagonist, a crass truck driver who gets more than he bargained for gambling and drinking one night in Chinatown. The women, not surprisingly, are almost completely relegated to a single scene in a brothel. The truck driver is played by Kurt Russell, his fourth collaboration with Carpenter including the 1979 TV movie Elvis, seen during the opening credits blowing hot air into his CB about how things are and how things ought to be (while intermittently engulfing a hoagie). This role was tailor-made for Russell's sensibilities and his Jack Burton, who drives a rig cutely dubbed The Pork Chop Express with a crude grill ornament, would have shined in another B action-comedy if he wasn't circumvented by the gaudy art direction, icky visual effects and the rather tiresome nature of the non-stop mumbo jumbo he (and everyone else for that matter) is subjected to once he arrives in Chinatown. It's not as if Big Trouble in Little China is always a misfire: There are some well-lit moments augmented by a catchy synth score. Russell (when he's allowed), gets in a good one-liner or two, and his ode to Used Cars (1980) is an amusing tribute. Those moments are fairly easy to forget, however, with such suspect script writing that sees an ancient Chinese sorcerer (James Hong) operating beneath the streets of Chinatown, who kidnaps a Hong Kong bride-to-be of the trucker's Chinese buddy (Dennis Dun) because of her green eyes (actress and former Penthouse Pet Suzee Pai is half-white), which will bring him life again once they exchange nuptials. The evil magician inadvertently hits pay dirt when sexpot Kim Cattrall gets caught-up in the melee (she has green eyes, too). Notes:  This review was originally hosted at Adam Laidig's blog, The China Dragon, and has been shared to LoveHKFilm.com with permission.